At the end of World War II, the Netherlands’ infrastructure was in ruins. Birth rates, by contrast, were higher than ever. The result was a major housing shortage, and the post-war government responded by building hundreds of thousands of new houses and apartment buildings. It was an era characterised by hope and ideals: the war was over, and things could only get better. Architects wanted the new residential neighbourhoods to be a reflection of society. These new areas, they felt, should be home to a mix of all socioeconomic classes. The post-war architects put their faith in mankind’s essential goodness. They believed all apartment residents would put out their garbage on time, keep the galleries clean and coexist peacefully with their neighbours. Reality, however, proved to be a little more intractable. Today, the remaining urban districts from this post-war reconstruction period no longer reflect the fabric of society. Those with higher incomes have moved out, in search of more luxurious surroundings. An increasing number of residents view the apartments as cramped, poorly insulated and noisy. In some cases, the typical staircase-access flats and public parks – originally intended to provide social meeting places and a more pleasant living environment – have become havens for loitering youths and drug users. In order to deal with this problem, reconstruction-era neighbourhoods across the Netherlands are now being drastically renovated. The Staatsliedenbuurt (1954) in Utrecht is one such neighbourhood. Photographer Lotte Sprengers studied the neighbourhood with urban sociologist Thaddeus Müller. 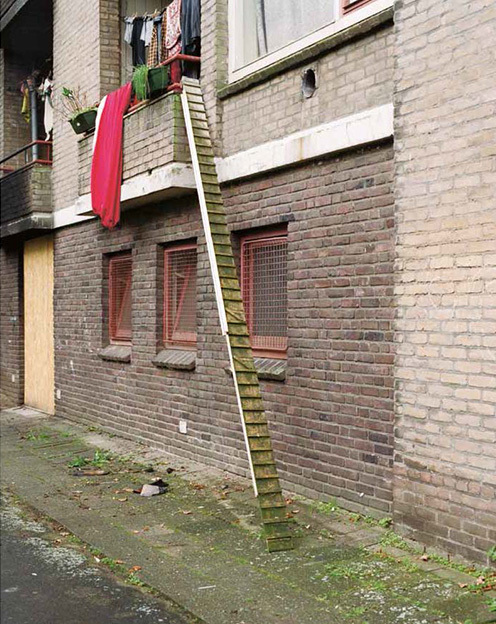 In the period between 2008 and 2011, Müller interviewed thirty residents, visitors and professionals involved with the Staatsliedenbuurt. He found that most residents were satisfied with their houses. None of the interviewees were planning on leaving the neighbourhood. “As far as they’re concerned, they’re lucky to have found a cheap house near Utrecht ́s city centre. They also regard the houses as relatively large. Students are especially enthusiastic. For them, a house in the Staatsliedenbuurt is a one in a million opportunity.” Longstanding residents are also enthusiastic about their homes, Müller explains. “Although they’re aware the houses are poorly insulated against noise and can be difficult to heat, they’ve gotten used to these drawbacks over time. Most of them also have close ties with other neighbours.” According to Müller, most residents are relatively untroubled by the crime and lack of safety the municipality makes so much of. As Sprengers and Müller found, the majority regard these problems – such as loitering youths and crime – are incidental rather than structural. As it turned out, the neighbourhood that municipal authorities regard as a problem area is simply a pleasant place to live for many of its residents. A place where you can stop for a chat with the local shop owner, or the neighbour lady from upstairs: a neighbourhood where you can knit in the community centre, or relax at home with a puzzle. As Sprengers discovered, it’s not that residents don’t see the problems around them: they simply accept them as a fact of life. Municipal officials describe the neighbourhood in terms of condemned housing, social problems, crime and nuisance. For its residents, however, the Staatsliedenbuurt is something else entirely: Home. Home offers both residents and outsiders a glimpse of the real Staatsliedenbuurt. Not just a plan on paper, or a breeding ground for social problems, but a place where people live. Lotte Sprengers (1980, Utrecht, The Netherlands) is a documentary photographer. She studied at the Hoge school voor de Kunsten Utrecht (HKU). She is interested in human behaviour within defined contexts such as villages, neighbourhoods or (religious) communities. She concentrates on individuals within groups. Her work is objective and intimate at once. It has often been said that an important characteristic of her work is her integrity towards the subject. She currently teaches at the Royal Academy of Art in The Hague (KABK).